Katha Pollitt pointed out on FB and via Twitter how absurd it was of Jacobin magazine to write an article glorifying the relationship of Karl and Jenny Marx. Unfortunately she was wrong about the article being written by two men - one of the authors is a woman. But that did not surprise me at all, this being Jacobin, frequent publisher of Doug Henwood, whose Ladies Auxiliary regularly attacks feminists. 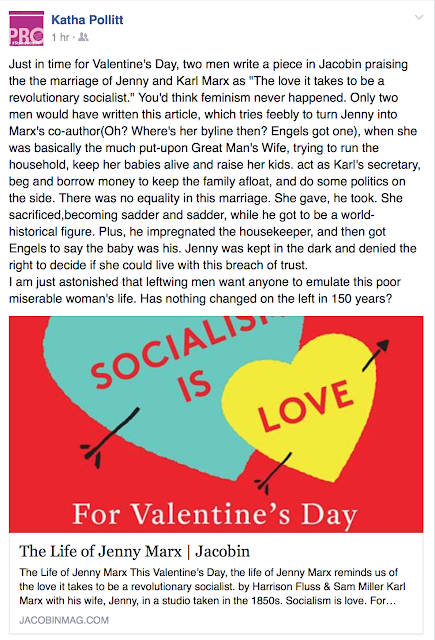 But even more so, a magazine that publishes Doug Henwood naturally finds the marriage of Karl Marx to be the ideal - the wife worked and sacrificed and was cheated on and doesn't get credit for all the work she put into Marx's writing directly. The perfect helpmeet for the founder of Radical Chic. The side of feminism I’ve studied and admired for decades has been about moving towards that ideal [of a more peaceful, more egalitarian society], and not merely placing women into high places while leaving the overall hierarchy of power largely unchanged. In other words, the kind of feminism Henwood admires isn't about women at all - it's about peace and egalitarianism. Presumably egalitarianism would help women, but Henwood clearly prefers not to talk about the ways in which women as a group suffer from the lack of equality. Because you know, all the proletariat is oppressed equally, so why should we make a special point about women? It's bros before hoes all the way with socialists and other worshippers of Karl Marx. Women do well to never forget that.